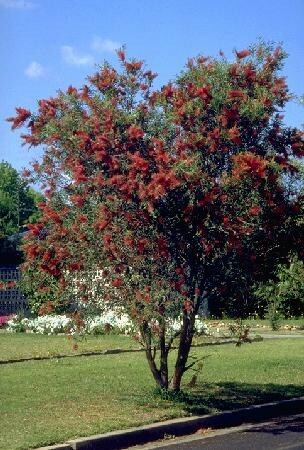 Callistemon Viminalis-The weeping bottlebrush is typically a small tree with pendulous foliage although some forms are more pendulous than others. It reaches a height of about 10 meters in its natural habitat but is usually smaller in cultivation, particularly in temperate areas where it is an attractive and reliable small tree for street planting. Once established, however, it is able to tolerate extended dry periods. The plant performs best in medium to heavy soils and can tolerate less than perfect drainage but may be damaged by moderate to heavy frost. It responds to annual fertilizing after flowering. Although the plant will respond to pruning, this can have the effect of destroying the appearance of weeping forms. In common with other bottlebrushes, plants flower best in a sunny location but they will tolerate considerable shade at the expense of flowering performance.